Joe Orton was a writer who dared to speak the unspeakable. He pushed the boundaries of common taste and decency. He tackled subjects others would find repulsive and flaunted the hard facts of everyday life to the masses; facts that people would prefer to sweep under the carpet. If mankind possessed any basic human values, they were thrown away; all classes were corruptible. Moralistic attitudes were daydreams. People in real life don’t have morals; they just try to persuade themselves that they do. They flagrantly despatch messages from their soap boxes of what is right and what is wrong, how we should live a good clean holy life and then they renege on their ramblings with their actions. Actions speak louder than words. You may scoff at the above, but the character Fay in Loot shows this with great aplomb. She sits with her rosary in hand, proclamations coming thick and fast about how the family should behave with respect in front of the dead, yet it becomes clear she has abused her capacity as nurse to the dying to ensure that she, not family, will benefit under the Will of the dead. But it is not just Fay who is a dubious character, all parties are corruptible on one level or another, and they don’t care who they cast to the lions. Orton's characters depict life as what it really is, a vicious but strangely funny world. People spend their days doing what they need to do to survive; if they are not cheating death, they are dealing with it, and in the case of Loot, with laughter at the core. Two of Orton’s best known plays are Loot and What the Butler Saw. In both of these he showed his mastery of the art of black comedy. His tongue in cheek approach allowed him to show in all seriousness the disintegration of society amongst us. "In a world run by fools, the writer can only chronicle the doings of fools or their victims. And because the world is a cruel and heartless place, he will be accused of not taking his subject seriously...But laughter is a serious business, and comedy a weapon more dangerous than tragedy. Which is why tyrants treat it with caution. The actual material of tragedy is equally viable in comedy - unless you happen to be writing in English, when the question of taste occurs. The English are the most tasteless nation on earth, which is why they set such store by it." Orton was born in Leicester 1st January 1933, the first of four children in an ordinary working class family. He was semi-illiterate, missing a lot of school due to his asthma, but he had a passion for reading and amateur dramatics. Following speech lessons to remove his lisp, he was accepted at RADA, where he met his future friend and lover Kenneth Halliwell. The emergence of Mr Sloan. Prison changed both parties. Halliwell became more withdrawn whereas Orton took the opportunity to use his new understanding of the society that he lived in to write his plays. He saw what lay under the superficial nature of society. Buoyed on by the success of his BBC radio drama Ruffian on the Stair, he wrote his first full length play, Entertaining Mr Sloan. It depicted the 60's as a ruthless time, where nothing stood in the pursuit of personal happiness, and how drugs and music had impacted on society. Sir Terence Rattigan proclaimed that Entertaining Mr Sloan was the best "first" play he had seen in years, he praised the use of language and the construction of the play, but it was not a sentiment shared by everyone and so when Sloan transferred to the West End, the press joined forces with public condemnation of the play stating it was "dirty highbrow." Orton, himself helped to encourage further outbursts by posing under the pseudonym Edna Welthorpe to write to the Daily Telegraph letters page, "I myself was nauseated by this endless parade of mental and physical perversion." 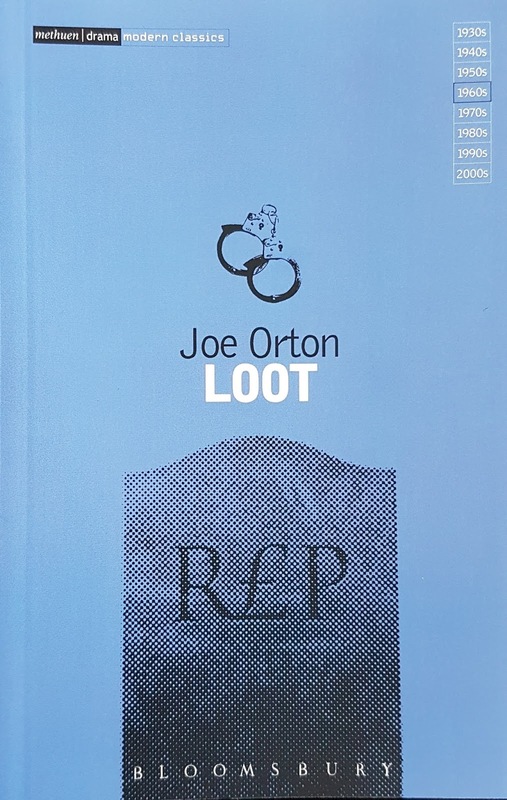 Orton knew the limitations of his first play and started working on Loot – a play which would take its revenge on the Catholic Church, British law and enforcement and how money is at the root of all evil. Two young friends, Harold and Dennis, take advantage of their current situation (one works in an undertakers and there is a bank next door) to rob a bank. They burrow between the undertakers and the bank, storing rubble in the empty coffins, and then realise they need to find somewhere to stash the contents of the robbery. 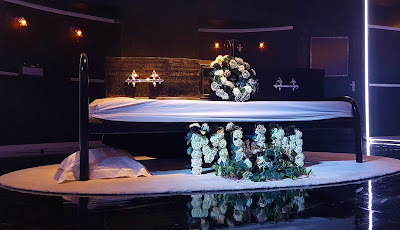 Harold’s mother has died, and as the law is beginning to bear down on the two thieves, they decide the occupied coffin is the best place to safely store their ill-gotten gains. Add to the mix a gold digging nurse, a grieving widower and a psychopathic policeman; you have the contents of a hilarious farce awaiting you. Loot was a completely new entity for the British Stage. It mixed together the elements of a classic farce with dubious morals, designed to both shock and delight in equal measure. Despite it having an all-star cast (Kenneth Williams, Geraldine McEwan, Ian McShane and Duncan Macrae) the director found it hard to mix the brutal nature of the text with the open levity of the situation. Orton was asked to re-write the text a number of times, so the performers never knew from one day to the next what were expected from them. The play was a complete flop and closed within a month. 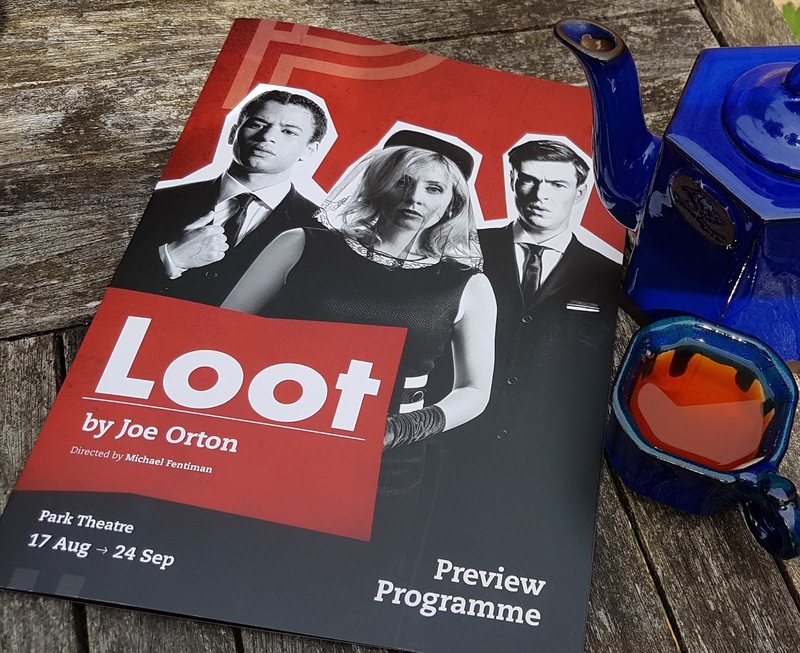 50 years after the brutal murder of Joe Orton by his lover Kenneth Halliwell, Loot has returned to the Park Theatre stage back in its original format. 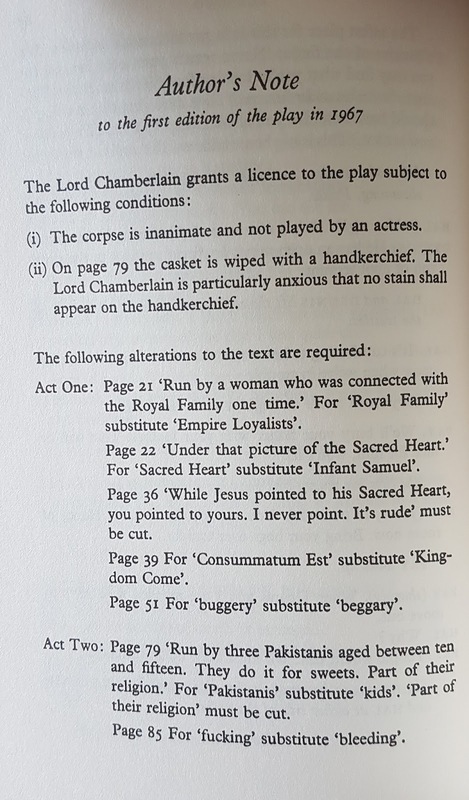 (The Lord Chamberlain had put a number of restrictions on the play before it could be performed on its 1966 West End debut, mainly due to its immorality!) The play starts with a radio playing in the background. Sadly, because of the noise of the audience chattering away, I missed a lot of it, but I caught snatches of a Joe Orton interview, and what sounded like Mary Whitehouse’s condemnation of society! It was a joy to watch what Joe Orton had actually written, not a sterilised version of his thoughts and ideas of the time. It was brave of director Michael Fentiman to take the risk, but I think the risk has worked. Homosexuality was illegal when Orton wrote Loot, but times have changed and audiences are not as easily shocked as they once were. It’s difficult to understand that phrases such as “the wreaths are blown to buggery” were removed for the sensitive nature of 60’s audiences, when we read conflicting reports of how “open-minded” the sixties were! Fentiman’s direction takes on board Orton’s desire for the play to be acted seriously. Sinead Matthews, as the gold digging nurse Fay, has some of the best lines in the entire script, but she says them with such solemnity that you can’t help but laugh out loud at her open hypocrisy. Fay: She (his dead wife) had a deceitful nature. That much is clear. We mustn’t let it happen again. I’ll sort out some well-meaning young woman. Bring her here. Introduce you. I can visualise her – medium height, slim, fair hair. A regular visitor to some place of worship. And an ex-member of the League of Mary. Fay: Exactly. Realise your potential. Marry at once. This is the success of a great writer. The laughter comes from what he has written, not slapstick physical comedy, or played for laughs on stage which would have Joe Orton turning in his grave. That said, there is a lot of physical humour when it comes to the corpse. 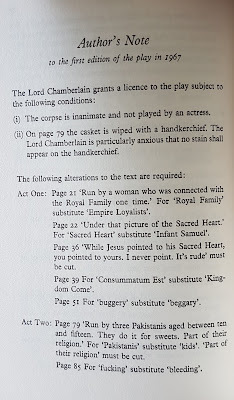 The Lord Chamberlain banned the use of an actor, here, at The Park Theatre, the role was played by Anah Ruddin who should be given great credit for how well she played her part. Her body was thrown about the stage like a ragdoll, and jammed upside down in the wardrobe. What she went through has to be seen to be believed, and she certainly deserved the extra applause she received when she rose from the dead to take her curtain call! If I did have one criticism to levy it would be Christopher Fulford’s take on the corrupt Truscott. He was a little too “shouty,” more of a caricature than a character. This stood out particularly because everyone else played their roles down, which ironically led to the amount of laughter the play received. That said, I think Orton would be pleased with this quick-witted production. If you’re going to celebrate the 50th anniversary of someone’s bludgeoning to death, then a good dose of macabre laughter is the greatest form of medicine! Loot runs at The Park Theatre London until 24th September, and then it transfers to The Watermill Theatre, nr Newbury, 28th September to 21st October 2017.